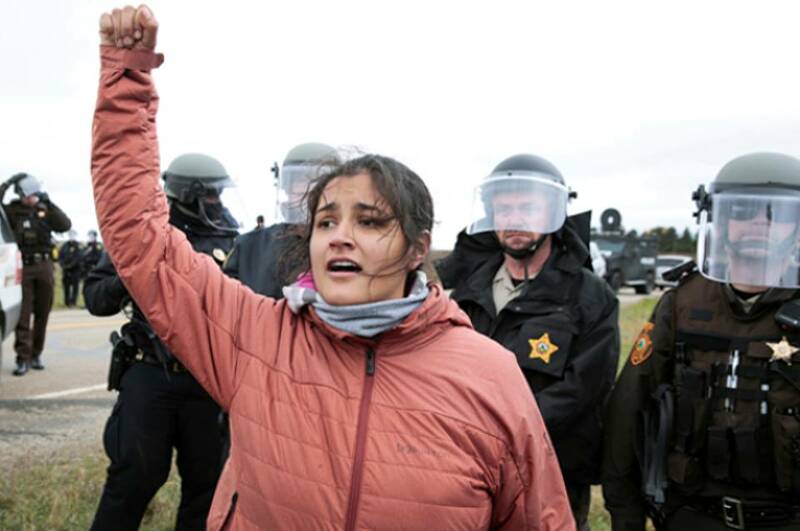 Ta’Sina Sapa Win of South Dakota’s Cheyenne River Reservation chants in front of police during a protest against the Dakota Access Pipeline outside Saint Anthony, North Dakota, October 5, 2016. Indigenous Peoples Day is an answer to the offensive Columbus Day holiday that glorifies the European conquest of the Americas. This year Oct. 10 was a day of new arrests of the heroic Standing Rock resisters to the Dakota Access Pipeline, being built by Energy Transfer Partners to transport half a million barrels of oil a day across four states. Solidarity actions were also held across the country. On Oct. 9, a U.S. court, in clear violation of signed treaties, had ruled once again in support of corporate power and against Indigenous nations. The U.S. Court of Appeals for the District of Columbia Circuit rejected the Standing Rock Sioux Tribe’s motion for a permanent injunction to stop the $3.7 billion pipeline. The events that unfolded on the eve of Indigenous Peoples Day once again exposed the criminal role of state power to protect the ruthless capitalist drive for profits. The courts, police and U.S. military performed as they have historically, using military invasion, removal of the people themselves, legislation and racist policing. Some 27 people were arrested after confrontations at construction sites on Indigenous Peoples Day. The arrests included “Snowden” film co-star Shailene Woodley, who was charged with “trespassing.” About 100 protesters were at the construction site when the arrests were made. 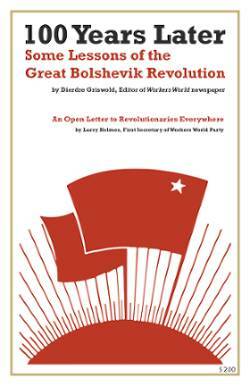 But solidarity and determined resistance continue to find a way forward. In an effort to push through the pipeline, the courts had given it fast-track approval in July. But then thousands of Indigenous resisters and their allies, using direct action, rallies and a growing encampment at Standing Rock, drew international publicity. In late August a federal court was pressed to grant a temporary injunction stopping construction on the section of the pipeline stretching 20 miles east and west of the Missouri River. But on Oct. 9, the court reversed itself and refused a permanent injunction. Fearful of growing support for the resistance, the court also left open a way to reverse its decision. The ruling acknowledged it was “not the final word,” noting that the final decision lay with the U.S. Army Corps of Engineers. This body is notorious for using its authority over vast construction projects to benefit corporate power. The Missouri River is the main water source for the Lakota Sioux Nation at Standing Rock and for millions of people in four states. Corporate pressure to protect capitalist profit has again and again been considered more important than protecting the land, water and treaty rights of Indigenous nations. The largest U.S. banks, such as Bank of America, are behind the pipeline construction and the dangerous practice of oil fracking and drilling. Billions of dollars are at stake. The Dakota Access Pipeline had originally been planned to cross the Missouri River north of Bismarck, the capital of North Dakota. However, over concern for the city’s drinking water supply, the route was moved downstream to treaty lands of the Standing Rock Reservation. The court battle is continuing, with further legal appeals. And the struggle continues on the front lines. Since an initial encampment began at Sacred Stones on April 1, thousands have joined more than 300 federally recognized American Indian Nations at Cannon Ball, N.D. — site of the Oceti Sakowin Camp — to protest the pipeline. Determined activists are now winterizing the encampment to keep a presence through the extreme arctic cold of North Dakota winters. The fight to stop the Dakota Access Pipeline is a struggle for Native sovereignty and the right to control Indigenous land, water and other natural resources. The resistance organized at Standing Rock is also over defense of pure water as a human right of all people. Resistance and solidarity events continue under the banner of “#NoDAPL. Flounders visited Standing Rock in September as part of a solidarity delegation of the Workers World Party 2016 election campaign.